IF YOU want to know the latest news about training and education in the chimney sweeping industry – come alone to the seminars being held this March, at the Guild Trade Exhibition 2019. This year, there are two free seminars organised for show attendees on the subjects of the BurnRight Consumer Awareness campaign and the Chimney Sweeping NVQ (National Vocational Qualification). The Chimney Sweeping NVQ seems to have piqued everyone’s interest. We all know that chimney sweeping is an unregulated trade and there are a lot of cowboys out there. That’s why we take regulating ourselves very seriously indeed. Phil Cleaver and Chris Geeves, from Chimney Skills Training (CST), believe that it’s time for chimney sweeping to become professionalised on a wider scale and become officially recognised as a trade. That’s why the duo, both teachers and approved assessors with CITB and NSAC, have created the NVQ, which is recognised by the Construction Industry Training Board. 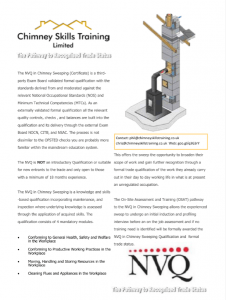 They are both NVQ assessors in chimney ocupations. Phil and Chris will give an informative presentation about the qualification and also answer any queries you may have about it. This seminar takes place at 10.30am on Saturday 2nd March. 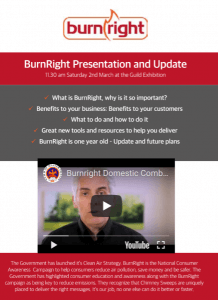 The BurnRight seminar will be held at 11.30am on Saturday, 2nd March – marking exactly one year since the campaign was first launched! Chimney Skills Training and BurnRight both have a stand at the Exhibition and will be around over both days to answer any questions.